Sync Folders Pro synchronizes any number of local folders on-the-fly whenever there are changes, or on external drives either manually or at a set time (when connected). 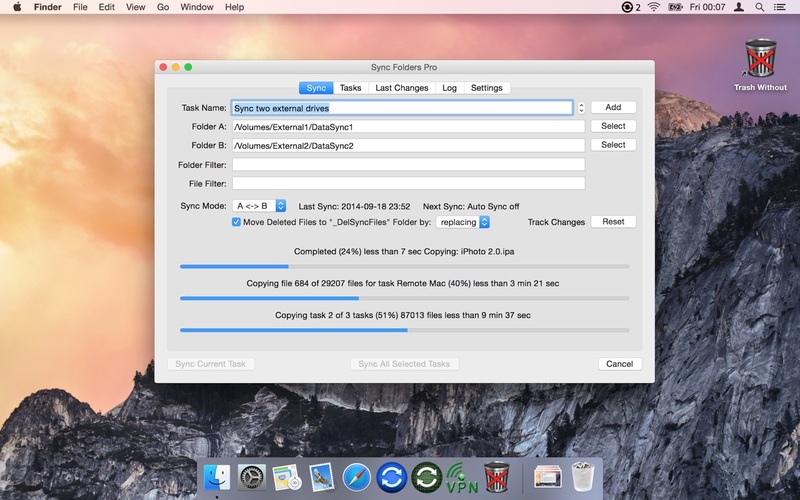 The app synchronizes folders with or without filter for folder names and / or file names. Sync Folders Pro is perfect for backup to USB, memory cards, disks on remote computers on your network, or folders on Cloud services (Dropbox, etc.). It’s compatible with OS X 10.9 and Retina displays. Try it for free with the free version, which is available on the website, and compare the sync speed and stability versus similar apps (for more than 50,000 files). The comparison of two folders (6.24 GB and 92 470 files in each folder) is one minute. Sync any number of folders same time. Tracking deletions in synchronized folders, real 2-way sync. Automatic synchronization on the fly, when there are changes. Schedule your synchronization for any time. Synchronize Macs across a network. Synchronize external drives (USB, memory cards, etc.) with your Mac, and vice versa. Powerful filter for files and/or folders on the entry and/or exclusion. View the latest changes in synchronized folders. Quick view last changes and Finder integration. Saving the synchronized files in a specific location («Del folders»). Using this mode you are insured against accidental deletion of files, and can always return all the files even if you are re-sync a few times. Structure of folders and subfolders stored in the «Del Folder». Each sync task has the status showing when it was done last time. Save / Load the settings to the file. Logging of the synchronization process. Localization of the application in multiple languages (Český, Dansk, Deutsch, English, Español, Français, Italiano, Nederlands, Norsk, Polski, Português, Slovenski, Suomi, Svenska, Ελληνικά, Pусский, العربية, 한국어를 지원합니다, 中国的, 日本人). The ability to create your own localization based on available localization (user’s localization). Save / Load the version of the localization to / from the file. Next story The Bible 4.12 – Easy-to-navigate offline Bible app. Previous story Fenetre 0.6.2 – Keep a window open, on top of everything else. Winclone Pro 5.3 – Clone your Boot Camp partition.